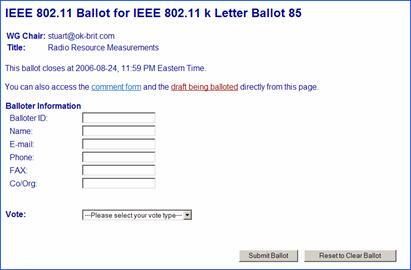 These instructions apply for IEEE 802.11 Letter Ballot 176 (LB176) which is a Recirculation ballot asking the question "Should P802.11ae D3.0 be forwarded to Sponsor Ballot?". This is a 15-day Recirculation letter ballot and the voter’s pool for this ballot is the same voter pool that was used for the original letter ballot that passed the 75% threshold for 802.11ae, i.e., Letter Ballot 169. If you have voted on any of LB169 and 172, you are not required to vote on this ballot. Your most recent ballot will be carried forward. If you wish to change your vote, you must respond to this ballot. You must follow the instructions below to vote. Do not send an email to vote. Voting by any method other than the web-based process described below will invalidate your vote. Failure to follow these instructions will result in your vote being discarded as an invalid vote. Not voting on letter ballots or sending an invalid vote can affect your voting privileges. This ballot opens on: Mon Apr 11, 2011 at 23:59 Eastern Time USA and closes 15 days later on Tue Apr 26, 2011 at 23:59 Eastern Time USA. (Add reminder to calendar). The draft is password protected in accordance with IEEE 802 Policies and Procedures. To obtain the draft, use the username and the password supplied to voting members for the 802.11 WG private area. You will see the following web page. Note: All fields, except for the FAX field, are required in order for your vote to be valid. Please fill out the balloter information that is requested. This is the unique and secret number that the 802.11 WG Vice Chair has sent you. If you have lost this number, email the WG Vice Chair for it. Do not use your old badge number. Do not use your new badge number. You will also receive a confirmation web page for your vote. If you are submitting comments, click on the “Submit Comments” button. This will take you to the page similar to that shown on the right. 1. Select the second option ("File Upload"). 2. Click on “Continue to the Submit Comments Area”. ** Why does this rule exist? Using any other means of conveying comments (such as one of the other 3 options, or a direct email to the chair) doesn't guarantee that all the necessary information has been collected. It may also require excessive manual cut and paste operations to get the comments into the consolidated spreadsheet of comments. This takes you to the page shown on the right. 3. Browse and select your completed comments file. It is not necessary to put anything in the file description or accompanying explanation boxes. Make sure you are familiar with and follow the instructions in "Completing the comment form" below before uploading your comments. Comment type - select "Technical" if any technical comments are included or "Editorial" otherwise. 5. Select "Upload file now"
You will automatically receive an email confirmation of your vote. Form The official comment form for Letter Ballot 176 must be used. The comment form is available here. Names In the header of comment response form, please fill in your name in the <First Name>, <Last Name> fields. Do not use your initials or anything else. And don't include the angled brackets around your name. Clause Column This is the section number of the draft that your comment applies to - e.g. 2.1 or 4.2.3. If you have a comment that applies to the entire document put "General" in the section field. Don’t put “all”, “many”, “various” or any other word you may personally fancy. If the field contains anything other that a clause number or “General”, the comment will be discarded and your vote possibly invalidated. If your comment relates to a table/figure, place the clause in which the table/figure resides in this column and put a reference to the table/figure at the start of the comment. Put only the clause number and not the words, e.g. “clause”. Page No. / Line No." Column If you choose to include a page / line number reference in your comments, please do so by entering it in these columns. Do not put this info in the clause number field. The rational is that the page/line numbers are valid only for the balloted draft version. Clause numbers are more likely to still be correct in later versions. "Comment Type (E or T)" Column Please use an E or T only to indicate a technical or an editorial comment. Please use upper case only so things sort right when we get all done. Incorrectly categorized comments will be re-categorized by the Task Group chair. "Part of No vote” Column If you say "no" in this column, we will feel free to skip that comment in terms of formally satisfying a "NO" vote. For any comment that is not part of your “NO” vote, mark it as "not part of a no vote" by entering “N” in the column. Any voter that votes “NO” should have at least one comment marked “yes” as part support for their “NO” vote. Any voter that votes “YES” should not have any comments marked “Y” in this column. "Comment / Explanation" and "Recommended Change" columns These are pretty self explanatory. If you do not recommend a change the comment may be skipped as you have not asked the group to do anything. Please keep the explanation of the comment separate from what you want done as a result of your reasoning. The voting group is too large for the task group to be interpreting what you are requesting. Please remember that the operating rules state that all “No” votes MUST be accompanied by comments which include specific reasons and enough information for the group to understand what you desire in order to change your “no” to a “yes”. Simply saying “not good enough” is insufficient as the task group cannot reasonably be expected to understand what would satisfy the commenter and so invalidation of the vote is justifiable. The redline draft (if present) is there to show differences between a version being balloted in the current ballot and a previous version. Due to limitations of the tools used to produce the redline, this version of the draft may contain artifacts arising from the comparison process. Before reporting a comment against a problem found in a redline draft *always* check that it is also present in the clean draft. Regardless of the above, always report any page and line numbers from the clean draft.